Imagine a scenario where you are in a mall browsing through a few shops. Suddenly you see something that catches your eye and you think of purchasing it. It is not the old times anymore and it is possible that you might get a cheaper deal online for the same product. Of course, one possibility is that you have apps for various online stores. Or you can use your browser on the phone. I know I have done that often enough. However, it is completely possible that you are stuck with no data connection or possibly have a phone which doesn’t have those features. Snapdeal has come up with sms service for such people. All you have to do is send an SMS to Snapdeal at 92789-92789 with the product name and in a few seconds the company would send the top results for that search and even links if you can/want to purchase the product immediately. There are two ways in which I see that it is immensely useful. One is for people who do not have smartphones with them. Despite the surge of smartphones, that population of people who do not have mobile internet & smartphone is still substantial. These people will be able to retrieve the product price information easily. Also, if someone is having problem with their internet connection this is a good solution. 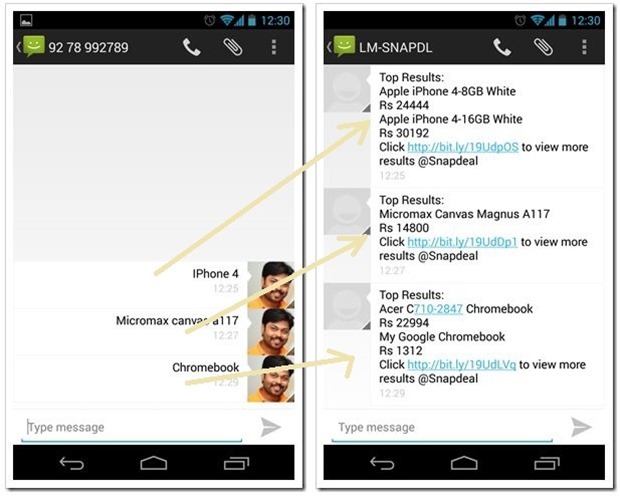 Snapdeal is offering this service free of charge, only standard SMS rates will apply. Another case I see stems from the speed which this service is providing. I used it and I could not keep my mobile on my table after sending the message before the reply was there. It would have taken more time for me to open browser and find the results on my 3G connection, even more so on a 2G connection. Thus, if you need a result quick, this service will be quite suited to the situation. These people then can view the product on the site by the link provided. All in all, I can see it to be quite a good service, if you already use Snapdeal for purchases. What’s your take on this? Give it a try and let us know what you feel about this service! Works gr8.. thanks for the info.